As a propane dealer and valued community member, Doke Propane plays an important role in consumer safety. Doke Propane works closely with the propane industry to keep our employees and customers well informed and safe. 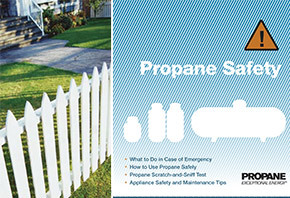 Part of this process is providing valuable information on how to stay safe around propane. Click the image on the right to view important safety information. Safety brochures are also available from our drivers, or at our offices at 206 N. Springfield Avenue in Bolivar. Or simply give us a call at 417-326-6111 with any questions you might have.